If you remember, back in the fall I was thinking about doing a powder room refresh for J, but I wasn’t totally feeling any of the wallpaper samples/vision boards that I put together. The samples hung in the bathroom for months and after looking at them daily, I just couldn’t make a decision. I’ve learned over time that maybe I needed to wait and choose something that I really loved. Here’s the post, and here are the three vision boards originally created. There are a few details that I am keeping in mind with this refresh. Positives: J has extra tall ceilings and a nice white pedestal sink, which is staying. Changes: Adding fun, removable wallpaper | incorporating a slight masculine touch (maybe?) | adding painted molding/wainscoting on the bottom half of the walls | adding a new mirror, lighting and accessories | possibly putting some shelves above the toilet | adding some fun art to pull it all together. Musts: This bathroom must be durable enough to survive our combined five kids and large family. Most importantly, I want him to love it! So to begin this process, I used my snow day to create three vision boards using samples I recently ordered from Etsy. The first vision features large gold peony wallpaper on a white background. I’d love to paint the wainscoting a slate blue for a unique look. I would tie it all together with gold accessories and a statement piece of art. This particular print reminds me of all of us at the beach. Plus, I love the colors! My second vision features another large scale floral wallpaper in tones of whites and tans, with black, grey and greens. To balance the lighter paper, I thought a darker lower half (black or dark grey) would make the white sink pop. My plan would be to mix in some wood tones and mixed metals, namely golds and coppers. My last vision is the most bold of the three, but I LOVE this paper. I’m just not sure J will go for this one (lol). The colors are GORGEOUS in this design…shades of pink, blush, greens, creams and black. As you can see from the image with the chair, the flowers are extremely large, but the ceilings in the bathroom are nine feet high so I’m not worried about it. I would probably keep with lower half white, but touches of gold and lucite tied with natural elements would finish the look. I thought I’d pop in with another little family room update. I posted my vision board for this room a little while back and I’ve been slowly doing my research and ordering things as I see them. We made some progress on choosing some big items and I am super excited to see it coming together. In my opinion, I think it’s so important to take your time when creating a room, especially one that is a primary living space. Choosing things that you LOVE and will cherish is so important when creating the perfect area. This room is one that gets the most wear and tear by our kids and families and for that reason, I’m being extra mindful when choosing elements that not only reflect our personal style, but would be durable and withstand everyday life. My first thought was to lighten up the room as it can be quite dark. Even with windows, the light streaming in seems to be at a minimum. I also wanted two couches that are kid-proof. Finally, J really wanted the TV hung over the fireplace, which would be located at the top of this picture (not shown). They won’t be delivered until close to Christmas, but I think it’s worth the wait. We also purchased two of these chairs from World Market on a great Columbus Day sale. I still stop and stare at them every time I go by. The rich, velvety shade of bluish-green, the shape, and the gold legs make this chair a winner. Today my parents stopped by and I could tell my mom wasn’t too sure what to make of them. That is, until she sat down. They are so comfy! Win-win in my book. Comfortable and full of style! My rug search was ongoing, and I saw a few that I liked online (Wayfair, Joss & Main, Overstock, etc) but I wanted to make sure the colors were just right. Don’t you agree that it’s sooo hard to choose rugs that you can’t see in real? After posting a carpet recs post on Facebook, we were able to visit a local store and they had tons! Best part — they let us bring two home to make sure! Who does that?!? That said, I am so glad we did because I ended up choosing the rug that I didn’t originally think I would choose. My wish was to find a large Persian rug (10×13) that was distressed. I wanted the base to be ivory, scattered with tans and taupes. A touch of grey would be fine, but J’s kitchen doesn’t have any grey and I want both rooms to coordinate. And….I found this one! It may appear grayish in the picture, but in person it’s not. We do need to order the larger size with a three week delivery timeline, but we aren’t in a rush. The actual rug looks more like the one in the picture below. I also posted about my end tables that I found on Craigslist. $40 bucks for the pair! Nobody in my world can see my vision, but that’s ok. I know they will be great! 🙂 My plan is to paint them a glossy white and add some new, chic gold hardware. I love the lines in the front, and the extra storage they will provide will be beneficial. It was a little chilly today, but I started sanding them down with an electric sander. Next step is to clean them with mineral spirits and then paint when it’s a nice and warm(er) fall day. Let’s talk about paint. I’ve had these six samples up on the wall for about two weeks and J still can’t tell the difference. But I can. I finally decided on Benjamin Moore’s Linen White (top middle) for it’s creamy color. In addition to paint, J’s rockstar uncle is going to help me put up board and batten in the entrance/small hallway off the garage. This will serve as a “faux” mudroom. Since the painting swings around to that area, I thought it would be best to do it all at one time. Here’s an inspo picture I have posted on Pinterest, and I can’t wait to see it finished. I think it will add a nice dimension and separating point between that area and the family room. This is another reason for choosing a creamier white. I wanted a bit of contrast between the glossy white of the lower wall with the creaminess of the upper wall. I’m constantly popping into my local Home Goods because you never know what they are going to have. Two accent pieces I picked up along the way were these framed geodes for the gallery wall and this magazine holder. Last, I know I’m getting ahead of myself but when deals strike, you must jump. I really wanted to get matching Christmas stockings for all of us that would coordinate with the new room. I was looking all over, but kept coming back to the fur stockings from Pottery Barn. As luck would have it, J and I stopped by Pottery Barn to look at coffee tables and guess what they had??? Stockings! And they were on a killer sale. I purchased seven on the spot. I love how they are all different, but they all have the same cream-colored velvet top. I also found an embroiderer and she is going to embroider our names in a chocolate brown. I LOVE them! My plan is to wrap them up and have the kids open them on the day we get and decorate the tree. So that’s about it for now. I’ve been very busy coordinating this room and it makes me so giddy to see it come together. J sometimes can’t believe how excited I get over rugs and end tables. As I said, we are not in a rush, but the timeline is working out perfectly. Coffee table – Still looking for a narrow, long table. I don’t want anything too bulky or dark. I’ll keep you updated! Couches – we could have them for Christmas, but I’m not worried if they don’t come. By the new year, it will be almost done. I am waiting until after everything is installed before I finish the gallery wall and add other accent pieces. Despite our fourth Nor’easter in a month, I am still thinking ahead to warmer temperatures and sandal weather. It’s hard to believe that yesterday was the first day of spring since I’m looking outside my window to blustery snow and a winter wonderland. Even the decor in my home has been switched out to display spring-like colors. Gone are the tweedy pillows and heavy fur blankets. Like I’m sure everyone else is feeling, I’m over winter. With the change of the seasons and holidays, my bar cart also gets a new look. I like that I am able to switch out the decor to go with the seasonal themes. Recently I posted about my quest to find art for above my bar cart. Although I am still searching, this time I shopped my home to find this abstract piece which I placed behind the cart give it a colorful backdrop. Within this vignette, there are a few personal pieces that mean so much to me. The bunny was given to me by mom years ago, 2001 to be exact. She dates everything! The bunny is simplistic enough to go with any decor and it makes an appearance every year. The Pennsylvania cup is way older than me, and was given to me by my grandfather. I think he had a set of four behind his bar, and each of the four granddaughters got one to remember him. I love to add colorful cocktail napkins and paper straws on a bar cart. Not only are they pretty, but useful. Colorful coffee table books are a great way to add color and pattern to the lower level of a cart. I also love to use wine glasses to hold bunches of flowers. The stem of the glass provides height when they are tucked in the back of an arrangement. I’m ready for spring, but Mother Nature says otherwise. Enjoy your Wednesday! It’s been a little hectic around here lately. With last weekend being my daughter’s performance weekend, I didn’t have a lot of time to write and photograph for blog posts. Saturdays and Sundays are the days when I get most of my blogging work done, and it just wasn’t happening. I also want to thank you to everyone who reached out with the kind comments and notes in support of her. It was an amazing few days! I did squeeze in a little time to finally organize my gift wrap and ribbon. Although I am saving my garage for a summer project, I really wanted to get my wrapping paper in check because it’s too pretty not to display. You see, I have a little problem with paper and ribbon. I love them. And I know I get this addiction from my mother, who has a self created “store” in her basement. She has boxes of every shape and size, wrapping paper and bags for every season or occasion, gift tags and cards galore, and enough ribbon and bows to wrap for over 1,000 people. If I’m ever in a pinch, I know I can call her and she will have the exact paper I am looking for. Even better, she sometimes offers to wrap it! So that being said, I have my own little stash of paper and ribbon that I wanted to organize. To do this, I used The Container Store’s White Elfa Utility Gift Wrap Door and Wall Rack. Right now, it is on sale and they are offering free shipping as well. This is the photo from their website. I love how everything looks organized and cohesive, yet visually appealing. Assembling and installing was very easy. No extra hardware was required besides using the Allen wrench needed to tighten one screw. That’s it! I have to say, the construction of the metal and all of the hooks and baskets included in the kit were well-made and sturdy. Everything that you see pictured in my photos was included. I ended up not using a few translucent boxes because I didn’t need them, but it’s nice to know I have them as extras. I am a huge fan of colored paper in all patterns, especially if they can be mixed and matched. Most of my wrapping paper comes from Home Goods. Their rolls are under $3 each and the paper is thick and durable for wrapping. There is nothing worse than cutting cheap paper and having it tear half way up the cut. Every time I am there, it is hard to resist the many rolls they have. I also made a place to store my rubber cement and mounting squares since I grab them all of the time. My go-to gift bags are colors of brown, white or gold. They are versatile and can be used for anyone – male or female, and for any occasion. The bags can be switched out with different ribbons and tags, and I always have them on hand. Bottom line, I love my new wrapping paper station. It’s also safe to say, I don’t even mind having the closet door open for all to see as they arrive in my home! Holy cow, do I love long weekends! Today we have off in observance of President’s Day and boy, am I loving it. I wish every work week could be four days. Can you imagine all of the extra stuff we would get done with an extra day?! Two days of the weekend to recover and have fun, and one additional day to get crap done. Yep, that would totally work for me. Speaking of weekend, yesterday J and I completed a little project in his basement that we’ve been meaning to conquer for a while. About a month ago he began pulling out all of these cool pictures that he had hiding away in his closet. They were images from his past…some Penn State and Paterno, some Eagles. He’s a huge Hall and Oates fan, so there was a framed album from the group. I told him to gather all that he had, even items he thought to be strange to include on the wall. After some searching, he had a nice collection of unique items in all shapes and sizes. To add some visual interest, I found an aluminum B to be used as a center focal point. As a reference, his basement is very long. The space where the gallery wall was to be hung was behind an antique shuffle board table from his family. That thing is enormous and we figured it to be around 18 feet. It was also a little tricky to take photos in this space, but I think I captured it all. Here’s the view from afar. To start, we spread all of the items out on the table to get an initial visual of what it would look like. I really need to see things in front of me before hanging anything up. This also gave us an estimation on how much space the items will take up on the wall. Next, I traced each item on paper and cut them out to size. I really believe this step is important in getting the look you want. All too often people begin the hanging process without planning it out and they end up with something unexpected in the end. The extra time is worth it. Trust me. Once cut, I taped each paper on the wall where the actual item will be located. The beauty of this step is that you can move around anything that may seem out of place, too high, too low, etc. In this phase I moved around a few items to make sure it looked just right. I am so happy with the final product. Everything ended up well-balanced and level! There are even a few conversation pieces on the wall such as that wooden chicken bone plaque and an old Penn State notebook from the 20’s. This shot really gives you an idea how long the area is and how much wall space we had to work with. A view from behind the bar…. The best part is that J really seems to like it. All of the photos and items included are things close to his heart, so I was really glad to give him a way to display some of the things he loves. We also sent some photos to his kids and received positive comments from them too! Just popping in today to show you a fun trick that I use to add a little pizzazz to my dining room. I love the look of adding throw pillows to the chairs, whether they are on all of them or just the end two. 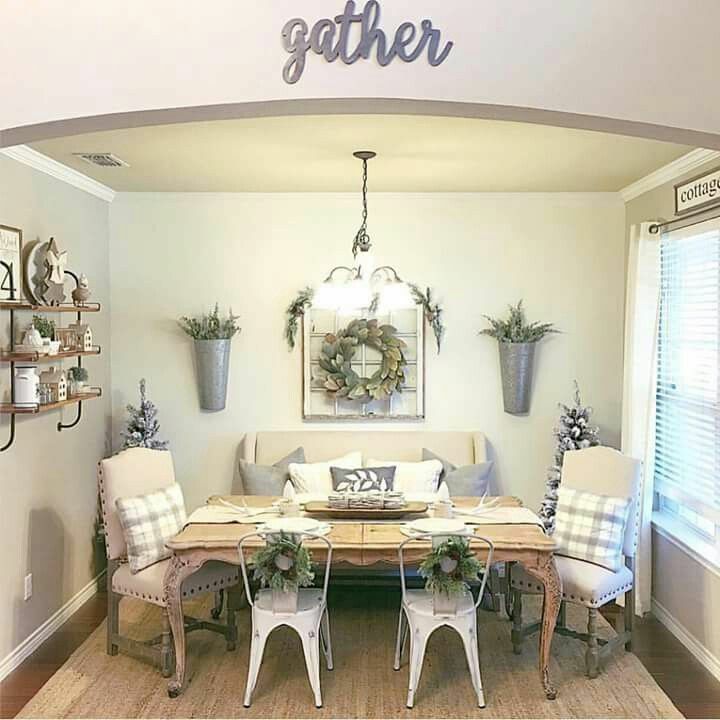 What’s better, is that places like Home Goods or TJ Maxx have many different styles and colors to choose from so your dining room doesn’t have to look the same from one month to the next. These black and white ones are a fav of mine and are moved around my home all year round. The floral ones are a new Home Good’s find. I also love the mix and match chairs/bench in the above image. Curating the room in this way allows the home owner to make the most out of the space they have for their furniture. What do you think? Pillows or not?